PLEASE NOTE:- One Large T-Shirt has the print on the back and the rest are all on the Front of the T-Shirt. T-shirt colour: Available in Light Grey Only. 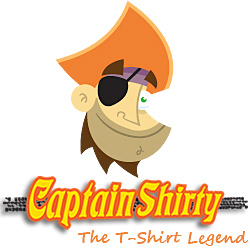 T-shirt artwork orientation: Large detailed artwork on the front to the rear of the Tee (as shown above). 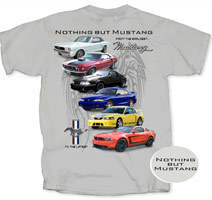 T-shirt artwork configuration: The 6 generations of Mustang proudly displays the body styles from the beginning of their creation, developing as they change and have ‘morphed’ into today’s current ‘pony car’ modern muscle car design. Our Tee shirt is printed on a 100% cotton pre-shrunk shirt and is the perfect gift for your Mustang ‘Pony’ car enthusiast. This Tee has the scripts “Nothing But Mustang” in simple style font located on the front left of chest. The artwork is of very high standard, with intricate details of each of the 6 Mustang generations. This product is officially FORD licensed. A very collectable piece for any Mustang enthusiast throughout the muscle car era!